I love running and sometimes I need extra energy to get me going. When I found out that I could get that extra energy through chocolate, I was very happy. I got to review Energems Great Tasting Energy Bites on my blog and the product arrive just in time, as I was training for a race. I receive all three flavors of Energems: peanut butter, chocolate mint, and chocolate. 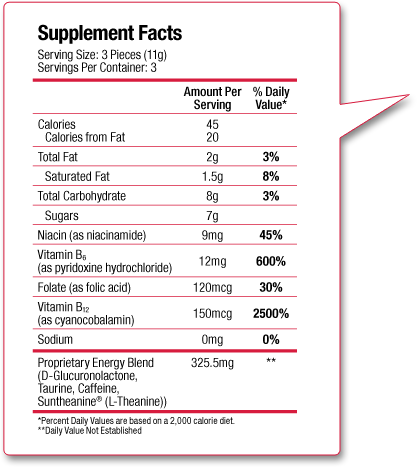 Energems has 75 mg of caffeine per serving and B-vitamins and amino acids. There is only 15 calories in each piece. When I run during the week, I will drink coffee a couple of hours before I run. The caffeine in the coffee gives me that extra energy I need to run fast. Coffee, unfortunately, is not good on race day as it moves things along in your lower bowels. So until now I have resorted to sugar based energy on race day. I love that Energems gives me the caffeine without the problems of coffee and it tastes great. I tried Energems a couple of days before my race to see how it works. I of course had to try all three flavors. The recommended dose is three candies. I ate the wonderful tasting Energems 20 minutes before I went running. While I was running, I felt more motivated to run my 5 miles without stopping. The Energems gave me the extra energy to make my run enjoyable. I brought Energems with me to my race, a 5K on Thanksgiving. I again consumed three Energems 20 minutes before the race. I ran a wonderful race and came in 2nd in my age category with a time of 25:15. Check out their FaceBook page to enter a contest to win Energems. I was going to try these but I am breastfeeding and wasn't sure how safe they were. I have never heard of them before, but I could definitely use them! I find (especially this time of year) I feel so run down. I could use an extra burst of energy to get everythign done! I have tried these once, and thought they tasted really good...plus gave me energy! Now this is some chocolate I could get used to! Especially trying to stay active during this time of year. These look great! I'm gonna have to check them out! have never seen these. Will definitley need to check these out Tara. I have never tried this product. Thank you for the information! I have heard about these and I think I just might need to try them. I actually don't mind coffee on race day because it doesn't take long for things to start moving, like it's a conditioned response and I don't even finish half a mug. But these would be nice to have when it's just before the race start for me. This sounds terrific! I love that they taste good! We use energy supplements in my house but they usually do not taste good. I LOVE anything peanut butter flavored though & hubby loves mint so I bet these are delicious! Good job on your race that is awesome you came in second. I have not been that close to winning a race in awhile lol!